Date Added: Monday 12 March, 2012 by Nathan B.
I received my Adventure Boots this morning, and all I can say is WOW!!! I hear the Raiders March as soon as I opened the box!! Magnoli has done it again with a super product that I know will stand the testimate of time!! 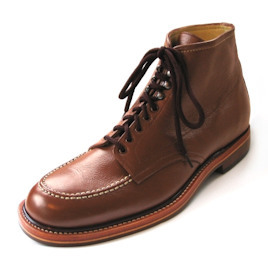 I ordered mine in his oilskin leather saddle tan with white toe stitching and flat sole. It looks like I went back in time to 1981 and pulled them right of Harrison Ford's feet!! Never having a pair of custom tailored shoes before, I was quite nervous as to how they would fit, but I can honestly say that the fit is perfect!! Thank you again Indy for an AMAZING BOOT!!! If you are looking to get an accurate Indy boot, then go with Magnoli's Adventure Boot because he can nail that look of the movie boot with no problem at all!!!.. Date Added: Tuesday 29 September, 2009 by Douglas M.
Date Added: Sunday 15 March, 2009 by JIM L.
February 2009 I ordered the cordovan dark brown, combat sole, no stitching boots. All I can say is WOOOW!!! These are the best boots I have ever owned. The style, fit, finish, and calf leather are very high quality. The combat sole is heavy duty, but it's not clunky, so I would still consider this a dress boot or anywhere boot. I've been to the local shoe store and tried on the Alden 405s , and the Brooks Brothers Peal & Co. Captoe boots. With the Alden 405s the color of the leather was terrible and you can't get a combat sole. The Brooks Brothers cap toe boots have a combat sole but the fit could be better and they are double the price of the Magnoli boots. You can't go wrong with the adventure boots, they are made to fit the shape of your foot, you have more options than you would believe, and you can't beat the pricing. The best part is I recieved my boots in 4 weeks from the time I place my order. That's service. You have a customer for life sir. Thanks Indy Magnoli !!.. Date Added: Monday 22 December, 2008 by Andrew P.
I've only just received the boots and so far have only worn them for a couple hours. They feel great and they look even better. But more than a review of the shoes I thought customers and potential customers should know that Magnoli works well with you to get your stuff shipped to you in a timely manner. I notified him that I had a family vacation coming up and the usual three weeks that these shoes take to get made shortened to a couple weeks from order to my house. Fantastic service!.. Date Added: Sunday 17 August, 2008 by Sean A.
Update: A few weeks after I got my boots, one of the speed lace eyelets snapped off. The shoes worked fine without it so I kept on wearing them. I contacted Indy Magnoli about purchasing some new ones from him. I got no reply and then got busy with other things and forgot about the whole thing. Fast forward to a few weeks later and I recieve a small envelope containing about 20 additional eyelets, free of charge. Quality customer service from Indy, for that reason alone he is worth buying from. Thanks Indy!.. Date Added: Tuesday 27 May, 2008 by Sean A.